David Williamson brings a wealth of goal keeping knowledge from both internationally and stateside experience. 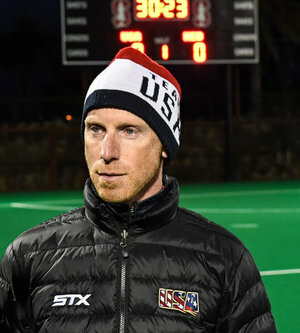 He’s been involved with the Ireland National team and currently serves as a goal keeper coach with the USA Field Hockey Women’s National Team and with Monmouth University. Though currently at Monmouth University, the last five years he’s spent coaching at Princeton University. Williamson was the Newry Olympic Hockey Club Player of the Year in 2001 and 2002. Winning a national title in 2005 and 2006 with Lisnagarvey Hockey Club, he most recently captured the Lenister League title in 2013 with Pembroke Wanders Hockey Club. Shoot and Save Clinic will focus on goal scoring and goal keeping. Field players will train a variety of shooting and goal scoring skills. Goal keepers will train a variety of goal saving skills. Players will train separately and also combine to train together. Any high school 7-12th grade field player or goal keeper. No club affiliation or status required.